Dixon's support has played a crucial role in the South African program and the former Victorian Minister is actively involved in the international "Sports for All" movement. Headed by the IOC, and in collaboration with groups such as WHO, it aims to promote the ideal that sport is a human right and encourages sports activity for people of all ages, both sexes and different social and economic conditions. Many good people have put a lot of effort into establishing Australian Football in some of these countries already, but there's no doubt that Dixon's network of contacts give the game an important extra edge. In the next few months he will attend a series of conferences where he will continue his main role but also look for further locals and officials interested in the Australian game. The ever growing participation rates of Auskick in Australia show the great potential of footy as an inclusive sport. Brian Dixon has recently visited the new program in Tianjin (in China), run by AusAID apointee Tom Mattessi, who has established two teams of locals, and has good support from Australian expat sides. Dixon also fielded interest from nearby Beijing, which would be very convenient opposition for the Tianjin sides. Further possibilities have arisen through a government official further south in Suzhou, a city of over 5 million people located 80 km west of Shanghai, the country's booming trade city. Dixon is working with the AFL on a plan to send two physical education teachers to Melbourne for two weeks in early 2007, training them in Aussie Rules with the intention of them taking the game back to one of Suzhou's municipalities that has 21 primary schools, several high schools and a major university. Having recently visited China myself (including Beijing, Shanghai and Suzhou), there is no doubt that the biggest hurdle our game faces is finding suitable ovals or indeed space for such facilities. Even reduced player versions such as 9-a-side will struggle to find fields as large as soccer pitches. Still, it is clear in China that if government support is there anything can be achieved. In the next few months Dixon will visit several other countries including India and the Philippines. He has already developed contacts in India who have attempted to track down the people who were reported to be involved in previous attempts to start Aussie Rules there, but they remain unreachable. Hopefully this fresh attempt will yield results. 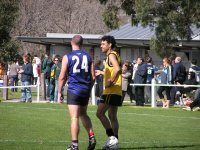 Likewise Argentina have an elusive Australian Football reputation, with a member of an alternative sports association running as many as four adult teams and some juniors. Information has been scarce over the years, and Dixon will pursue development through a new contact, though any chance to work with a pre-existing organisation will be welcomed (Dixon can be contacted through WFN if anyone has new information other than an internet search). Similarly he is looking at the Philippines, and will be in contact with the current team there (the PAFL). Much of Dixon's work relates to the "Sports for All" concept, and in November the 11th World Congress will be held in Cuba, which will give him the opportunity to seek contacts in that country. And finally he has hopes for attending a course in Nigeria in December, which would provide another excellent opportuntiy to do some important ground work in Africa, where long term it is hoped that South Africa will be just the start of footy on the continent. All this work will take time to build up and are only small steps along the way, but it is exciting to know that these first steps are being taken and with hard work, support and some good fortune, at least a couple of these countries may in future join the growing international Australian Football community.